Inexpensive, practical, popular and of course oozing quality. This group of words are exactly what, like a middle easter plague, have impregnated the Volkswagen brand ever since its inception in the chilly hills of Wolfsburg. Like a middle school boy that used to pee itself, VW was always remembered by its reputation that would keep with it for years to come. And this reputation would be similarly followed by the brands VW acquired through the times, albeit with their own unique qualities. For example, Seat would be for the shopper who valued style and performance in an affordable package, willing to give up on luxuries. Sort of the person who would buy a special edition toaster that came in a bright color. Audi would be for the buyer who wants more luxury in their lives which translates into unbelievably loud CLICKS from tuning knobs and sub-zero temperatures in the door handles. Then there is Škoda. The cheaper, insipid choice for the buyer who values price over anything else. This buyer will be so stingy that when his kids ask him if he could pay for the "Preferred Parking" at Disney he would flip them off. Now though, Škoda has evolved to become a brand that embodies Volkswagens attributes even better than Volkswagen themselves. Being a car company from the Czech Republic means that you have to instantly be competitor with the likes of Italian, French, British and most feared German cars. Most of what Skoda (I will now write it a normal S rather than Š due to its minor inconvenience) could do to get the coin from the middle class family men was to sell their cars for cheap. They weren't evocative or as practical as their competitors, but Skoda could stay afloat long enough for the lifeguard that was VAG to save them before an imminent death. A deal between these two companies began in the late 80's and full abduction to the sect corporation in the year 2000. From there onwards it was uphill for the Czechs. The Skoda Felicia arrived as one of the first cars done during the partnership followed by the Octavia and Fabia released in the late 1990's underpinned by the Seat Ibiza and VW Polo. From the beginning of their sales under the expensive belt of their new daddy, Skoda received fantastic feedback from the people. Truly effective marketing made the perception of the brand give a 180 degree turn and it was now seen as the "Thinking Mans" choice in each of its products. The constantly improving demand throughout Europe forced Volkswagen to work just a little bit more on their cars whilst leaving Skodas brothers un-pampered in the corner. As each generation of Fabia, Octavia, Yeti, Superb and every other model was introduced it was clear what Volkswagen was doing. Slowly beating themselves at their own game. The exteriors were more sober than even the staid Volkswagens, interiors showed a superior quality and people noticed it. Each of their engines was overly engineered to be as economical as possible but powerful enough to make the drive bearable. VW never went too crazy with Skoda's even when they were churning out 6 cylinder Golfs with AWD and Passats with W8 engines. 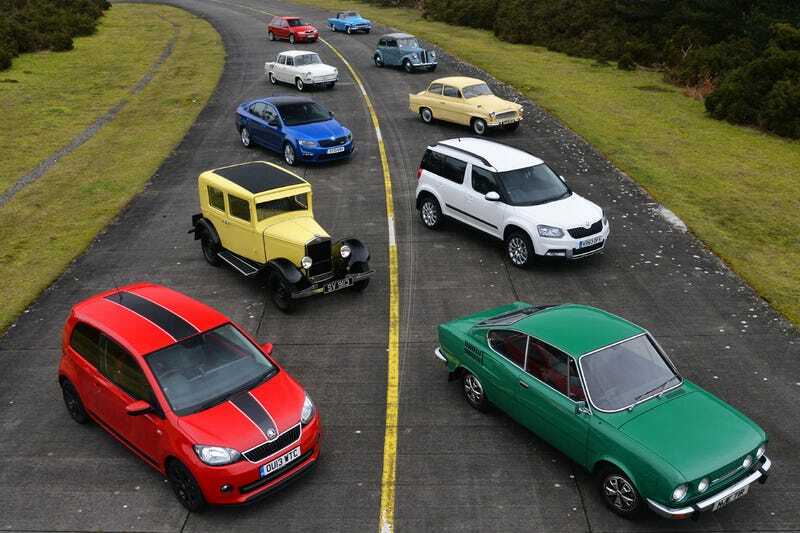 Its as if VW let Skoda have a a little bit of fun, but never too much to stray from the brands "Responsible" image. And to add to all of this, price. One of the very few things that Skoda kept from their past apart from their logo (Which is a winged arrow) was the cheaper costs. Cheaper to buy, cheaper to run, cheaper to maintain cheaper to insure and probably even to wash. All of these characteristics that were so significant of VW have migrated straight to Skoda. Check the prices of a Volkswagen Up! (Yay!) compared to the Skoda Citigo, or of the trunk space of the Fabia compared to the Polo. Even the superb Superb will cost considerably less than the Passat. As well as the more conservative price, the looks seem much more grown up than the VW's that are trying to be Audi look a likes. Interiors of both vehicles are top notch, but some of the features in Volkswagens have strayed too far from the economically conscious family man mindset. I can attest this as the owner of a MK7 Golf, which can park itself. Let me repeat that, the successor of the car that debuted in 1976 to replace the mother of all basic transportation can literally use its own brain to move the steering wheel for the driver and park itself. Add to this the optional sound systems and the Adjustable suspension. Imagine being a salesman and offering an adjustable suspension to a Skoda Octavia buyer, they'd tell you to get lost! The issue is, Volkswagen now has to figure out what to do about it. VW still makes excellent vehicles that offer all of Skoda's traits, but the reliability and overall response from the public favours the Czech over Ze German. Its a hard position in which both companies are for now, but as far as im concerned Volkswagen has become too upmarket to be the brand it once was whilst Skoda has become the true embracer of "The car of the people".